Valve's subtle hints led fans to the motherlode of TF2-lore webcomics. Valve is famous for three things: high-quality games, Valve Time, and advertising campaigns worthy of myth and legend. Whether announcing a new game or quirky character updates, Valve's use of clever alternate-reality games encourage players to find their own clues about the game company's latest releases, and usually rewards them in a spectacular fashion. A new Team Fortress 2-themed ARG that was completed this past weekend is no exception, as a pair of clickable blood spots on the TF2 website took players on a huge quest culminating in the discovery of the mutual enemy of Red and Blu teams, and a war against Saxton Hale himself. Of the two available links, the first took visitors to the birth notice of Mann brothers, who in TF2's lore founded the Red and Blu teams. What this letter reveals is the existence of a third brother, Gray, who upon being born was "absconded with by that Scourge of London, the Eagle". The second link updates Zephamiah Mann's will with the knowledge that Gray had resurfaced with threats of blackmailing his father for a "miracle gravel cache". It's worth pointing out that these details are probably among the least fantastic that we've seen in Team Fortress 2's advertising campaign so far. But it doesn't stop there. 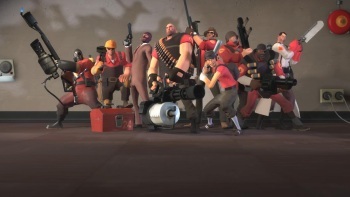 A simultaneous update to TF2 update allowed players using the high-five taunt while carrying the Capacitor to read joke descriptions listing various in-game items, such as: "Did you hear the story from 1306 where Enormous Haunted Eyeball, Dr. Whoa, Familiar Fez, Dispenser, Private Eye, Direct Hit, Googly Gazer, Kukri, and the Administrator walked into a bar?" This is the point at which it starts going over my head, but as this Google document notes, players were able to extract numbers from these jokes. These numbers revealed a crafting recipe, which in turn revealed a URL to a Team Fortress webcomic finally providing answers. The webcomic presents Red and Blu Team founders Redmond and Blutarch as they are tricked into a meeting by their estranged brother Gray. Gray announces his intention to put a stop to the senseless battle between Red and Blu over gravel pits to retake "the only thing in this hell-blasted landscape actually worth fighting over": weapons-producer Mann Co, currently run by Saxton Hale, the world's most powerful Austrailian. Once it becomes clear that Redmond and Blutarch are incapable of helping him in this task, they are dispatched, foreshadowing what may be the introduction of an entirely new in-game threat. In Valve's first Team Fortress 2 comic, the lore introduced a battle between the Soldier and Demoman classes that pitted teams against each other to win class-specific updates. Rumors and speculation on the internet encompasses everything from the introduction of a Gray Team, to the possibility of Red and Blu putting aside their differences to protect Saxton Hale from an army of robots. The discovery of the comic suggests that an official announcement from Valve will soon follow, but whatever the update entails we can agree on one thing ladies and gentlemen: There will be hats. By God, will there be hats.